This Maddie Boo children’s bedding reflects warmth and tranquility with a gorgeous plethora of Periwinkle fabric, accented with green jumbo polka dots. The Polly Children’s Bedding collection includes duvet cover, bed skirt, shams, pillows. Fabrics include Linen Celery, Linen Cornflower, Jumbo Polka Dot Spring, Periwinkle, Cabana Stripe Spring, White Pique. The Chandler bedding ensemble is made with Happy Stripe fabric that has beautiful pastel colors offset with Aqua Polka Dot fabric. This is a custom made children bedding set from Maddie Boo Childrens Bedding. The Chandler childrens bedding collection includes Duvet cover, bedskirt, shams, pillows. 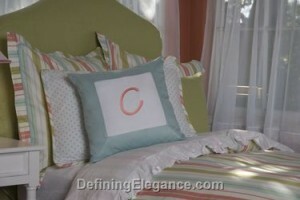 Fabrics include Happy Stripe, Mint Green Solid, White Pique, Aqua Polka Dot. The Cale bedding ensemble has a neutral palate of stripes and solids. It is suitable for young boys and teenagers. This is a custom made bedding set from Maddie Boo Big Kids Bedding. 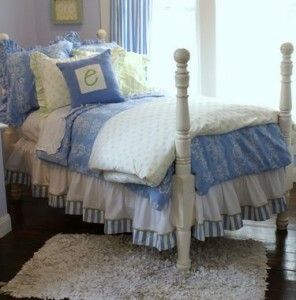 The Cale childrens bedding collection includes Duvet cover, bedskirt, shams, pillows. 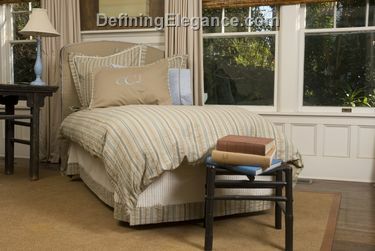 Fabrics include Light Chambray Fabric, Chenille Stripe Off White, Tanglewood Coffee Fabric, Dockside Khaki Fabric. The Bella bedding ensemble is undeniably charming with its large and bold red blossoms on a white background and paired with stripes and polka dots. This is a custom made bedding set from Maddie Boo Big Kids Bedding. The Bella childrens bedding collection includes Duvet cover, bedskirt, shams, pillows. Fabrics include Blossom, Roja Stripe, Linen Celery, Jumbo Polka Dot Spring, Cabana Stripe Spring, White Pique, White Flannel. This collection from Maddie Boo Big Kids Bedding includes a large black and white stripe and a scroll design. Touches of mint green soften the look of this bold style. The Amanda childrens bedding collection includes Duvet cover, bed skirt, shams, pillows. 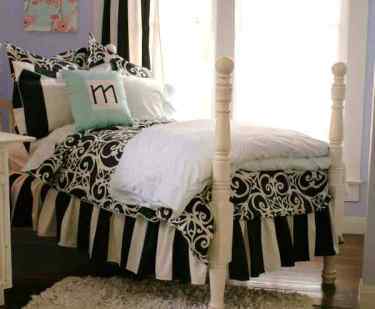 Fabrics include Scroll Black, Black and White Wide Stripe, Mint Green Solid, Aqua Polka Dot. 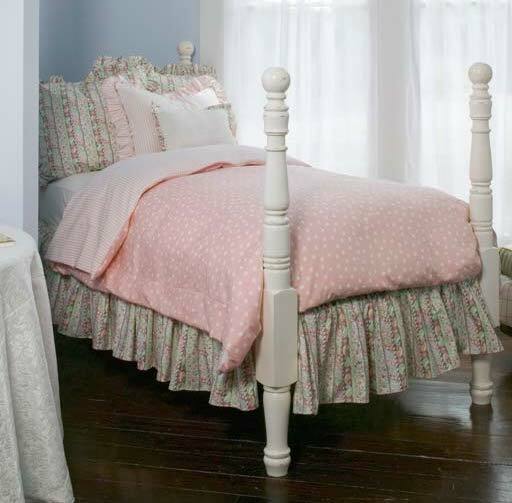 This charming collection from Maddie Boo Big Kids Bedding includes a pink and white color palate of sweet paisley fabric with a striped bed skirt. Pink is the sweet side of red. It represents sugar and spice and everything nice. The Anna childrens bedding collection includes duvet cover, bed skirt, shams, pillows. Fabrics include Sweet Paisley, Provence Stripe Pink, Light Pink Gingham, Linen Cream. This Maddie Boo children’s bedding is striking with its colorful large flowers and stripes. The combination of green, pink, red, and white is always a young girl’s favorite. The Alexis Children’s Bedding collection includes duvet cover, bed skirt, shams, pillows. Fabrics include Poppy Flower, Ribbon Candy Stripe, Poplin Red, Poplin Fushia, Jumbo Polka Dot Spring. This Maddie Boo children’s bedding is created with a duvet fabricated with Soft Pink Polka Dot fabric and a reverse of a small pink stripe. 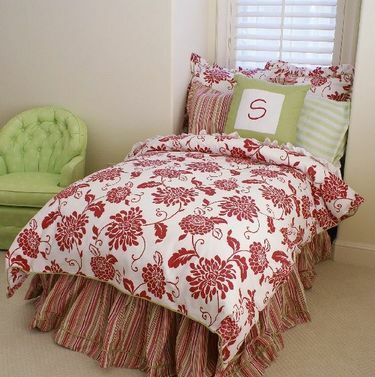 The shams and bed skirt are made with the Gelati fabric, a beautiful stripe of flowers and paisley in pinks, green, aqua, and chocolate brown. The Adelaide Children’s Bedding collection includes duvet cover, bed skirt, shams, pillows . Fabrics include Minky Smooth Cream, Gelati, Pink Ticking, Soft Pink Polka Dot. The King Sham choice creates the motif for this children bedding. Choose a Western States fabric with a cowboy and western themed design on a light blue background or the Mod Alpha fabric with large blue letters on a chocolate background. Maddie Boo Big Kids Bedding is designed by an interior designer experienced in working with nurseries and children’s bedrooms. The Jackson bedding collection includes a duvet, bed skirt, pillowcases, and shams. Fabrics include Chocolate Ticking, Chocolate Suede, Western States, Mod Alpha. Bursts of muted colors form circles on the soft blue background of this contemporary crib bedding. Maddie Boo Baby Bedding offers this collection in several standard products or it may be customized to your specifications. 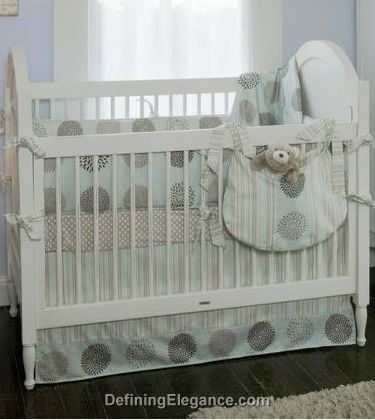 The Presley Crib collection includes a 4-piece set (bumper, crib skirt 20? drop, crib sheet, and crib blanket), crib coverlet, throw pillow, toy bag, fabrics, and moses basket. Fabrics include Portico, Emerson Stripe, Minky Smooth Fawn Polka Dot.